The number, size and distribution of ground-mounted, photovoltaic solar projects that generate electricity for off-site sale or consumption are expanding at quite a clip in New York. In fact, electrical generation from solar has grown by more than 1000% in the North Country  over the past 6 years. There is money to be made and policy  to provide the nudge. It also doesn’t hurt that the cost  of solar production is now comparable to, and in some instances, less than that of fossil fuel based technologies. Or that the externalities  (i.e., social/environmental costs) of solar, as well as other renewable energy sources, are much less than those for coal, oil, gas and nuclear energy. It seems the future of solar is so bright we’ll need to wear shades. But that’s putting the horse before the cart. We in the North Country value our open spaces, clutter-free vistas, farmlands, recreation and rural traditions. Solar installations, as described above, are recent additions to our rural scenery and may not appeal to all in the midst of forests and farms. The question, however, isn’t whether large solar has a place in our landscape (it will) but rather where we should direct such development and how much space we should permit for such purpose. It’s a tried-and-true, dyed-in-the-wool issue of land-use that’s ours to address through local planning and zoning; provided our choices don’t run afoul of the state’s interests. Aerial view of the 2 MW Lewis County Solar Project, Lowville, NY. This past May, we designed and co-hosted a workshop and forum for municipal leaders  focused on planning/review for large solar. The agenda derived from conversations with our event partners, the Town of Plattsburgh and the Franklin County Industrial Development Agency, as well as various local officials and aimed to provide attendees with appropriate tools, information and support necessary to accomplish these pursuits with confidence. We further sought to create an inclusive, participatory environment for all involved. See my previous article  for reference to this event. The rapidly growing number of proposals for commercial solar projects in NY reflects a real and durable transformation in the state’s energy infrastructure and markets. Municipalities across the state are responding to proposals for large solar projects with increasing frequency and without local zoning laws to provide clarity or guidance. Perspectives and criterion vary for what actually constitutes “large-scale” solar in NY, and that’s ok.
New York’s Clean Energy Standard  requires that 50% of our electricity come from renewable energy sources by year 2030. There’s little to mince here. We can expect continued expansion and diversification of commercial solar projects in NY for the foreseeable future; a take-home further reinforced by plans to modernize the state’s electrical grid  based on the the integration of distributed, renewable-energy generation. We can also expect a growing set of large solar projects in the Adirondack North Country region. This owes to our expansive land-base and that NY is actively soliciting large-scale renewable generation projects (Tier 1 ) to increase the state’s clean energy capacity. Not all locations will, however, be suitable for large-scale solar development, owing to such factors as surface topography, aspect, agricultural status, available grid infrastructure, etc. That said, proposals for large solar are piling up. A few basic terms and measurement conversions may help us get at what actually constitutes a large-scale solar project. For starters, electrical power generation is described in units of kilowatts (kW = 1000 watts) or megawatts (MW= 1000 kW). Rather dry terminology, I know. But here’s a useful application. A 1 MW solar array can provide enough electricity to supply the power needs of between 800 to 1,000 homes. It follows that in a village like Saranac Lake (pop. ~5,300), residential electricity use could be met with a 2.5 MW solar project (assuming an average 2.6 people per household ). Now, how much space would that require? Since a 1 MW solar array occupies about 6-8 acres of land, we’re talking 15 to 20 acres. That’s about the size of 13 standard issue football fields, including end zones. It’s also slightly larger than the 2.3 MW array at Clarkson University  in Potsdam, NY or the 2 MW Lewis County Solar Project  in Lowville, NY (see photo). Would our solar array for Saranac Lake constitute a large-scale project? Here’s what the pro’s have to say. NY-Sun  recently released a Model Solar Energy Local Law  that classifies solar energy systems into 3 tiers, all less than 25 MW. Projects at or above this amount are subject to state, rather than local, siting review. The Tier 3 category applies to ground-mounted projects starting at 25 kW or exceeding 4,000 square feet (ft2) of surface area. Tiers 1 and 2 are of smaller scale. The model law avoids mention of any nominal category for project size (e.g., small vs. large) and doesn’t include/define terms often associated with large solar installations (i.e., solar farms, utility-scale solar, community solar). We’ll need to look elsewhere for more specific sizing guidance. I recently surveyed all local solar zoning laws passed in NY that explicitly define and address “large-scale solar” or those project types listed above. Suffice to say, the concept of a large-scale solar project varies from one jurisdiction to another, particularly with regard to quantitative measures. Yet there are commonalities. Almost all of these laws distinguish ground-mounted solar systems that are tied to the electrical grid and produce energy primarily for off-site sale or consumption as attributes of a large solar project. It’s around the values for production capacity (e.g., kW or MW) and total area (ft2) that these laws vary. For example, our municipalities have defined “large-scale” solar using minimum production capacities ranging from 12-25 kW and up and/or minimum areas between 1,200 ft2 to 40,000 ft2. Having described large-scale solar as a land-use issue, it seems logical to focus on minimum area of cover as a distinguishing criteria. Yet, it’s hard for me to conceive of a 25 kW solar project  that occupies less than 1 acre (43,560 ft2) as large-scale. We might find a better delimiter by narrowing our consideration to criterion for “utility-scale” solar. These projects, designed to generate electricity for private or public utilities, must be large by anyone’s estimate, right? Again it’s not that simple. Rather than make comparisons similar to those above, I’ll point you to an article hosted by the Berkeley Energy Resources Cooperative titled, “How Big is Utility Solar? .” And then sum it up by offering that we are chasing our tail trying to locate a standard criterion for large-scale solar in NY. This may be cause for celebration rather than consternation! We have discretion to define large-scale solar based on zoning criteria that accord with land-use goals and interests specific to our own communities. It’s not one size fits all. Yet there are a few details we can’t overlook. For example, the Adirondack Park Agency ’s (APA) laws, regulations, and standards apply within the Park’s boundary and APA review will likely be a component of many, if not all, proposals for large solar arrays in the Park. There is also New York’s Article 10 Law  which affords the state final authority for siting review of major electrical generating facilities of 25 MW or more within its boundaries. What concerns me is that only a few municipalities in the North Country have enacted zoning laws to provide clear steps and circumstances for integrating (or excluding) large solar projects within their jurisdictions. By my count only 35 of 255 towns (14%) and 4 of 106 villages (4%) had passed zoning laws with criteria for large solar in ANCA’s 14 county area as of June 2018. We are in good company. As only 24% of towns, 3% of cities and 2% of villages in New York State have passed such rules on the whole; most of these within the past two years. These figures do not include moratoriums on solar development or zoning laws for rooftop and/or building-integrated solar projects. Here’s the rub. There is a growing queue of proposals for large scale solar projects among municipalities in our region that lack rules and requirements for these facilities. 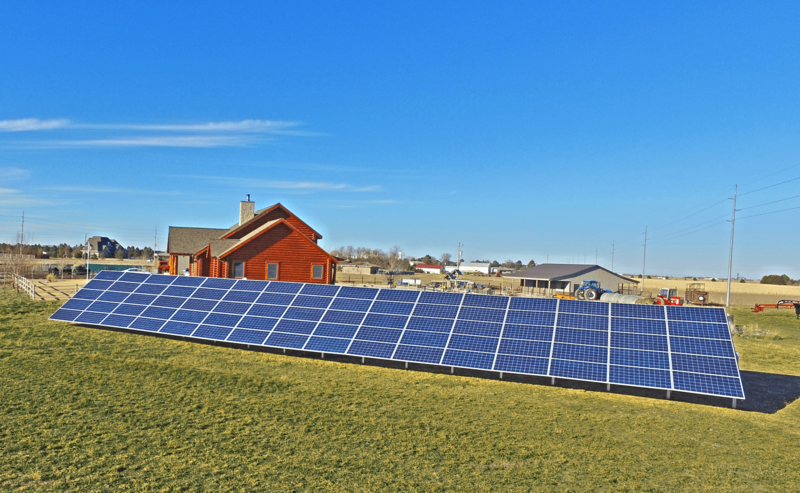 Since 2000, NYSUN has provided partial funding for 24 completed (i.e., grid connected) solar projects between 1 and 5 MW in our 14 county region, with another 47 projects in the pipeline as of this June (Figures 1 and 2, respectively). I’m still cataloging projects (1-5 MW) in the queue with our major private utilities, National Grid and NYSEG, that fall outside of NYSUN’s project inventory. But what about the real whoppers, those projects in the 10s-100s MW range? Data posted this June by NYSIO , the organization tasked with managing NY’s electrical grid and energy markets, also indicate that there are 5 projects between 20-180 MW proposed in our North Country region. Just to review, a 20 MW array could occupy 120-180 acres and a 180 MW project would require more than 1000 acres; which is similar in size to the North Star Solar Farm  in MN. The largest completed solar array in NY, the Long Island Solar Project , currently operates with a capacity of 32 MW. It’s worth noting that not all of the solar projects tallied above will be successfully completed. Perhaps 10-20% of the project applications reported by NYSUN and NYSIO will be withdrawn, based on precedent from previous years. Some may also be modified in response to concerns expressed by local officials and the public. But that’s purely speculation on my part. I can, however, share that the majority of large solar projects currently proposed in the North Country (1 MW or more) lie outside the Adirondack Park’s boundary. And that large-scale solar development will likely concentrate among communities at the borders of our region, those residing outside of APA jurisdiction and that host land suitable for solar development. We at ANCA encourage towns and villages in the Adirondack North Country region to establish zoning laws and other requirements for large-scale solar projects prior to receiving such proposals. This practice better clarifies for solar developers and citizens alike the expectations and pathways for project siting that create win-win opportunities rather than controversy and discord among affected parties. We also encourage municipal leaders to share information and resources within/across jurisdictional boundaries to better offset the costs of developing local solar laws (time, expertise, dollars, etc.) and/or to procure solar projects for municipal/public benefit. And we further encourage local officials seeking assistance and feedback for solar-related issues as well as planning to contact us. We will be happy to lend our staff as well as our network of partners to assist. Data included in Figures 1 and 2 are mapped at the center of municipal jurisdictions and do not represent actual project locations within these boundaries. As a Home Rule  state, local governments have authority to establish requirements and laws for land-use and development, provided they don’t conflict with “matters of state concern”. State authority for siting major energy generating facilities (25 MW or more) under NY’s Article 10 Law speaks to such concern. The extent to which local laws and perspectives influence any given Article 10 decision remains unclear; only one application (from Cassadaga Wind ) has been approved since the law’s inception in 2011. For additional information refer to the presentation prepared for our workshop by Jeremy Flaum (Dept. of Public Service - DPS), “Article 10 of the Public Service Law ”, as well as the DPS website for a list of proposed projects  entering Article 10 review. For examples of municipal projects and leadership related to large-scale solar in the Adirondack North Country, refer to presentations prepared for our workshop by Frank Pace , Fred Hanns  and Jason Pfotenhauer (one  and two ). And for a private sector perspective on project planning and development, see the presentation prepared by Gillian Black and Frank McLeneghen .